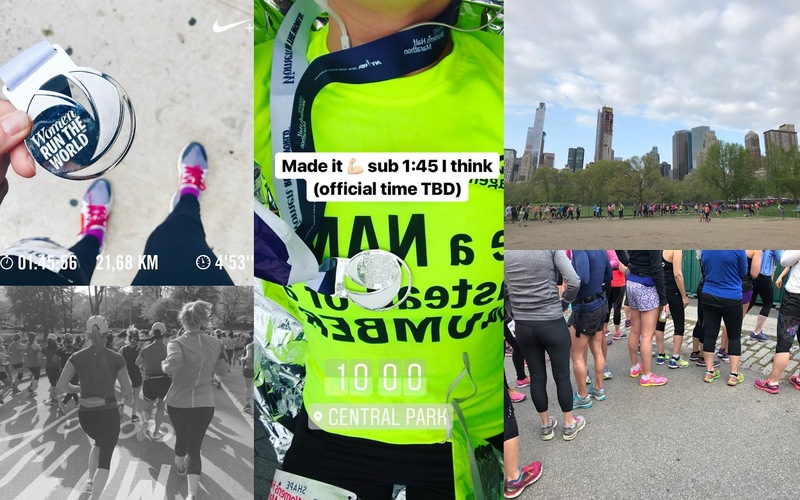 On March 8th I went for a run which was so nice I decided to sign up for my first half-marathon: the Women's Half Marathon in Central Park, which would take place 7.5 weeks later. It was quite a spontaneous decision, but 17 runs later, I felt like I was ready to take on those 21.1 kilometers on the big day, April 30th. The only race I'd ever done before was a 10k in London in 2014, so I was quite a running noob before this. In this post, I'll tell you how I prepared for my big race and how it went in the end! As I mentioned in my first post, Annemerel made me a little training schedule. I didn't follow it completely, but most weeks I managed to do the three runs and every Sunday I did the long-distance run, starting from 10 kilometers in the first week and ending with 18 kilometers two weeks before the race (and 12k the week before). Check my first, second and third update if you want to read more about my training. The days before the half-marathon weren't the best preparation. I had a friend visiting so naturally, we did a lot. We walked more than 20 kilometers every day, even the day before the half-marathon. Although I tried not to drink any alcohol the days before, we ended up going out two nights in a row. On top of that, I got a cold, which resulted in blocked ears, a bad cough, and a runny nose. Perfect if you need to run 21 kilometers at 8 in the morning. The night before I ate a big plate of pasta and went to bed early. The following morning I got up at 5:45, had my usual bowl of oatmeal with banana and peanut butter. By 7:30 I arrived at the start in Central Park. I dropped off my bag, did a few stretches, visited the dixies and before I knew it, the starting signal sounded (while I was waiting for the dixies for the second time so I skipped it and ran to the start haha). My goal was to run a time of 1 hour and 45 minutes, so I knew that I had to run around 5 minutes per kilometer (I didn't calculate it exactly so I should have run a bit faster to reach my goal). For the first two kilometers it was super crowded so I kind of struggled because I wanted to overtake people but I also knew I had to take it easy, so I kept it at an easy pace. At one point I got tears in my eyes because it felt so surreal to run with more than 6000 women early on a Sunday in Central Park. After 4 kilometers I found my flow and found a comfortable pace. The temperature was perfect, around 14 degrees, and the atmosphere was really special. I took some water or Gatorade at every drinking stop and drank it while running thanks to the two straws I kept in my pocket (thank you Lululemon). After 10 kilometers I decided I had to increase my speed a bit and try to keep it under 5''. 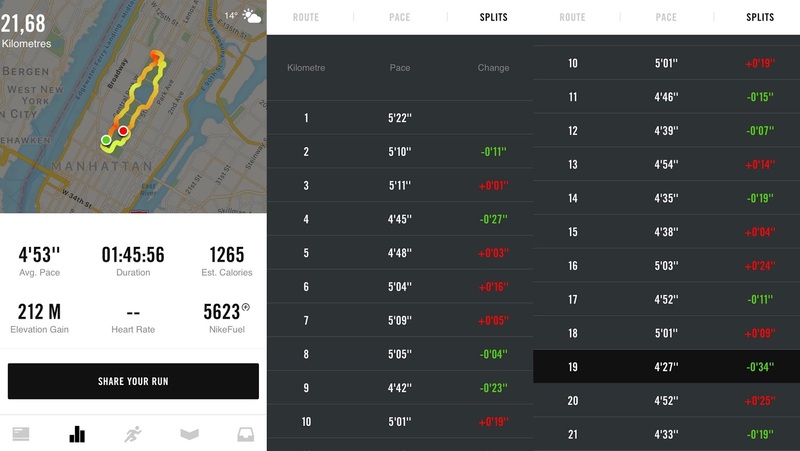 At 12k, I had done more than a full lap of Central Park and I was really starting to feel it in my legs, especially when we had to go up the Harlem Hill, which was killing. My legs felt super heavy and stiff/sore. From this point, I was really counting down the kilometers. At the last two water stops, I actually stopped for a few seconds to drink, at which point I felt how tired my legs were. The last four kilometers were the hardest thing I've ever done physically. I felt sick from the Gatorade so I had to focus on not throwing up while also trying to keep up my pace and pushing myself. About 700 meters before the finish my Nike app told me I had reached 21 kilometers so I knew I would be running more than the actual 21.1 kilometers (probably because I ran on the outer/right side of the track). Right before the finish line there was another incline and I hardly managed to do a final sprint. All I could think about was lying down, so I took my medal, two cups of water, an apple, one of those silver heat blankets and I found a bench to lie down. I finally made it! Officially, I finished in 1 hour 45 minutes and 40 seconds. 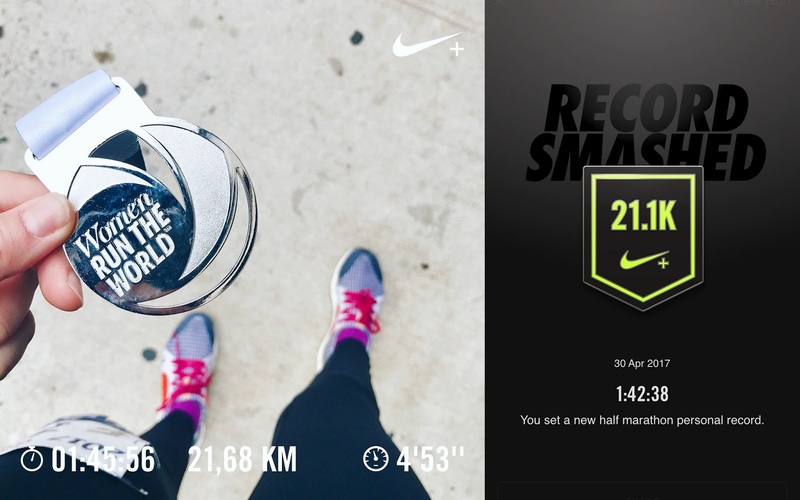 According to my Nike app I finished the half marathon in 1 hour 42 minutes and 38 seconds but because I ran more than 21.1 kilometers, my official time is a little over my goal time. I'm super proud of myself and my result, I can't believe I did so well! The only thing I didn't prepare for were the hills in Central Park, which seem to follow one after the other, which made this half-marathon quite a challenging one.